Museum Natural History - A Londoners Personal Review. 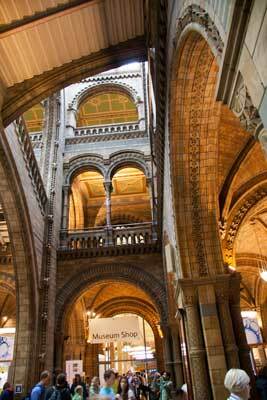 The Museum Natural History in London is one of my favourite London Museums. From the moment you walk in you will be having fun and this will continue for your whole visit. I have written this review of my last visit to the museum to give you a feel from a real person's point of view of just what you can expect when you visit the museum. 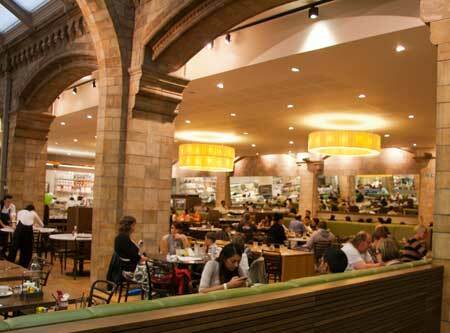 You can also add your own personal review of your visit to the natural history museum London. Tell us what you liked what you hated, what you would recommend to other visitors. 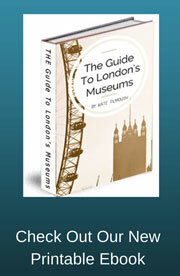 The more reviews the better you will make other peoples visit to the museum. On the day I visited it was pouring with rain and the queue to get in was long, as you can see from this short video clip. So do make sure you take an umbrella with you. Even though the queue was long it only took about 10 minutes to get in as they do like to keep everyone moving. 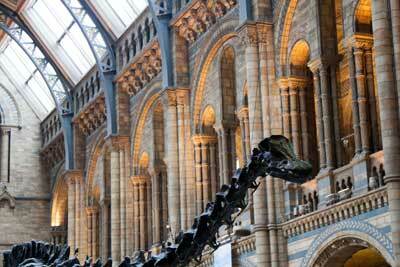 On entering the main hall of the Museum Natural History you are instantly confronted by one of the famous dinosaur skeletons. It is very impressive especially with the beautiful museums architecture surrounding it. It really is a stunning building which dates back to 1881 and is in the German Romanesque style. It really is worth spending some time looking up at the beautiful ceiling and natural world stone carvings. My first destination was the Blue Whale Hall which I have known since I was a child. As soon as I entered the room I could feel the same excitement I had felt when I first saw the giant whale when I was a small child (or course I was a lot smaller then and the whale seemed so much bigger). The room is packed full of giant life-sized models and skeletons of mammals ranging from elephants and giraffes to sea cows and Dolphins. There are also many interactive exhibits which are both fascinating and educational. This room has to be one of the most popular in the whole Museum Natural History. I then wandered into the Dinosaur area. This had changed a lot since my last visit and for the better. The lighting was low which gave the area a rather spooky feel. The room leads you through a suspended walkway which looks both down onto the many dinosaur skeletons and suspended ones close to the ornate ceiling. As you reach the end of the walkway you start to hear roaring sounds which heightens your anticipation as you turn a corner and come face to face with a life sized animated T-Rex. This model is designed to pick up on certain colours or shiny objects and will follow that thing around the room. So for some visitors they get a very unsettling feeling that the T-Rex eyes are following them around the room as they leave. By this time I needed a break so I visited the Central hall cafe for a quick bite to eat. I warn you this can still be a little pricey but the quality of the food was exceptional and the surroundings were comfortable and very decorative. 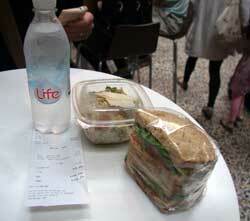 As a guide I bought a cheese ploughman's sandwich, a pasta salad and a bottle of water and this came to around £10. Next I went to the Darwin centre, again this was new to me and I was surprised at just how well it fitted with the 19th century building whilst being thoroughly modern. At the centre of the Gallery is a huge Cocoon which you are able to go inside and view some of the many thousands of bottled specimens from around the world. You can also view some of the scientists at work in their labs and if you are like me and are one of the curious ones who want to know everything, then this is a fantastic place as there is always someone around you can ask a few questions to if you want to know more about what work is going on in the Museum Natural History. It was now around 3pm and I was starting to flag but I just had to see the earth Halls. My first impression was wow; I hadn't expected this huge open main hall which contained a giant sized metal structure shaped as a planet. Along the walls there were exhibits containing different sorts of minerals and semi precious stones. They were stunning and such a better way of viewing them, all lit up in individual wall cases rather than when I was a child (the old Museum Natural History used to display them in unlit flat cases, row after row of them, very dull). Dull is certainly not a word I could use now. I travelled up through the middle of the giant planet on an escalator and as you go through the middle of the planet you see coloured lights and music is played (Jimmy Hendrix I think). This then takes you to other earth galleries where you can learn all about the changing planet and its eco system. Everything from floods and hurricanes to volcanoes are covered here. Not being as young as I once was I needed another break and so decided to head to the main restaurant for a little luxury break. This is a beautiful restaurant and very relaxing which sometimes you need during a trip to a very busy large museum. I only had a drink here but the break was what I needed. I finished my visit to the Natural History Museum with a quick stroll pass some of the very oldest dinosaur fossils the museums have. These have been here for as long as I can remember and they were now looking rather dated in their current location and setup. However it seems that even these old exhibits will soon be getting a facelift of some sort as they plan to update this area of the gallery. My day was exhausting but oh so much fun. I can’t tell you how much there is to see and do here and I would thoroughly recommend a visit to the Museum Natural History to everyone who comes to this fair city.